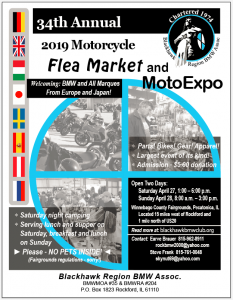 Calling all motorcycle enthusiasts, motorcycle and accessory dealers, vendors, and private sellers! 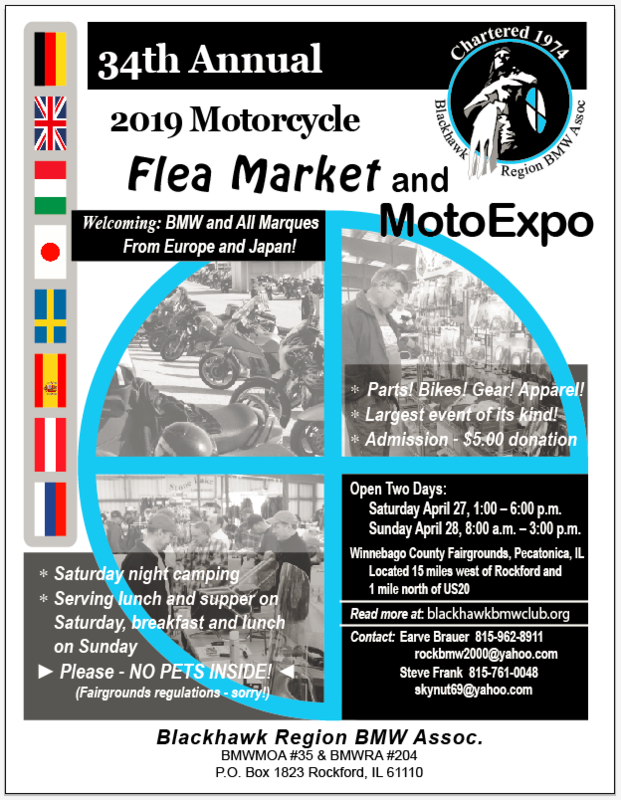 Huge indoor Motorcycle Flea Market and MotoExpo, open both Saturday afternoon and Sunday! We welcome back our BMW community and, starting this year, invite all Japanese and European brands to join us. Vendors, register early and get a free listing on our Website. Private sellers, rent a vendor space or sell your items on consignment at our club booth. Located at Winnebago County Fairgrounds, Pecatonica, IL, 10 miles west of Rockford and 1 mile north of US20. GPS coordinates: 42.316242, -89.366612. Buyers admitted with a $5 donation. Saturday camping for both vendors and buyers. Food available onsite: Saturday lunch and supper, and Sunday breakfast and lunch. Go to www.blackhawkbmwclub.org for details, vendor registration information, and event news.